White Water Gallery is pleased to announce this artist talk by internationally recognized artist Ram Samocha – based in England – on Monday April 5th at 5pm. 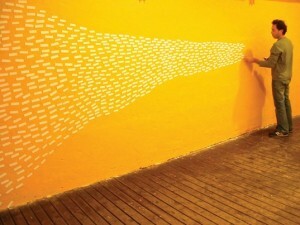 Samocha is a multi-disciplinary artist who combines drawing with video, animation, and performance, often mixing modern and traditional techniques of drawing to combine between 2D and 3D works. Samocha often works with temporary, flexible and portable surfaces and materials. 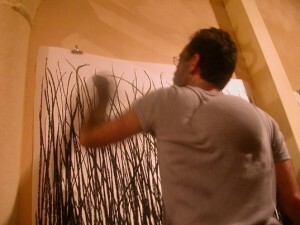 He is the founder of Draw to Perform symposium, an international gathering of artists and theorists involved in the discipline of live drawing performance. His work has been recognized nationally and internationally, is part of various collections, and has been shown in the UK, Israel, Italy, the Netherlands, Mexico, Canada and the United States. I always had problems in communicating. When I first started to paint at the age of 15, it really surprised me the attention and focus I got from it. The first artist that inspired me was Van Gogh, not by his intensive and problematic life story but mostly from his amazing attention for working with colors and also by the feeling of movement in his paintings and drawings. Moving from Israel to Canada had a lot of impacts on me. I always say that for me Canada was and always will stay as a healing place. The impressive and strong connection to working with colors in art made in Ontario was helping me (as I am color blind) to start using more and more colors in my own work. I think that coming in February to do a symposium in OCAD and also this current visit to Kirkland Lake is my way of saying thank you and trying to share what I found and discovered over the years also with local artists. The main thing is to do and show as much as you can. To share and expose your work in any way you can. I think that sometimes working and creating outside of the main art center can give you much more freedom to experiment and explore. Thanks to the Contemporary Art Exhibition based in Kirkland Lake, and Cesar Forero in particular, for making Samocha’s visit possible.